Do I need any special software to read the ebook? No! It’s a PDF file, and it’s easy to read on both Windows and Apple computers with the free Adobe Reader (or with Preview on a Mac). Can I read the ebook on my tablet? Absolutely. When you purchase the ebook, you’ll get an email with a download link. You can click on that link from the email application on your tablet to download the PDF directly to your tablet. On an iPad, once the PDF has opened in Safari you’ll want to open it in iBooks to automatically save it so you won’t have to download it again (iBooks also provides the best reading experience). The procedure for doing this varies depending on which iOS version you’re running. Try just tapping on the screen in Safari; you might then see an option to “Open in iBooks.” If you don’t see this option, tap the Share button (looks like a square with an arrow), and look for the option to “Copy to iBooks.” Either way, it may take a minute or two to open in iBooks, so be patient. You could also download the PDF ebook to your laptop for desktop, then transfer the file to your tablet with Dropbox or another file-sharing service. With an iPad you could also use Airdrop to transfer the PDF, or sync the PDF to your iPad using the Books tab in the iPad panel in iTunes. How do I download the DNG Raw files so I can follow along with the examples? When you purchase the ebook you’ll get an email with a link to the DNG files (there’s also a link within the PDF ebook itself). When you get to the page, don’t click on the folder – just click on Download in the upper-right corner. That should download the entire folder (called LRLandscapes) to the Downloads folder on your hard drive. Then just unzip the folder (if it didn’t unzip automatically) and import the images into Lightroom. 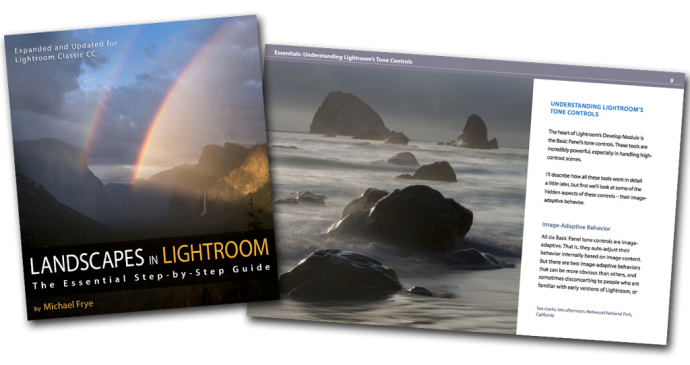 If you’re not sure how to import the DNG files into Lightroom, click here for detailed instructions. Email us at support@michaelfrye.com and we’ll try to help! If you’re experiencing problems downloading the PDF, please try to include as much information as possible, including the device and operating system you’re using, and what exactly happens when you try to download the PDF. Any information you can provide will help us help you!